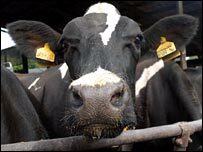 A superbug that has killed at least 60 people in the last four years could be linked to milk and meat from British farms, warn experts. A virulent form of E.coli, which is resistant to usual antibiotics, has been found on 11 cattle farms. The Soil Association fears increasing antibiotic use in animals could spread this resistance to human E.coli and make it harder to treat in people. Defra said it was aware of the issue and was investigating. A spokesman for the government body said it would respond to the Soil Association's concerns as soon as possible. The Soil Association has been campaigning to get the government to ban the advertising of antibiotics to farmers because it believes this is fuelling the appearance of drug resistant E.coli strains in both animals and humans. No such action has been taken yet by ministers, but the government has instructed scientists to investigate the problem. Dr Georgina Duckworth, a superbug expert at the government's Health Protection Agency, has compiled a report on the emergence of the strain, known as Extended Spectrum Beta Lactamase (ESBL) E.coli. She said: "The findings in our report show evidence of people carrying these bacteria in their gut. "If this is found to be commonplace in the general population, this may point towards the food chain being a potential source." Richard Young, of the Soil Association, said: "Although scientists do not know exactly what is happening at the moment, one of the most likely explanations is that we have got a flow of these resistant strains into the food chain." He called for the government to act now and impose tighter controls on the increasing use of antibiotics in farming. Professor Hugh Pennington, a microbiologist from Aberdeen University, said: "ESBL is spreading in the human population...and in the animal population as well. "One of the keys to solving this problem is to use antibiotics as little as possible."